It is with a broken heart that I write this blog. On December 28, 2018, we said goodbye to our beautiful sweet little Emma. She collapsed shortly after 12 noon. She had shown no signs of being ill. We rushed her to emergency and it was determined she'd had a stroke. Emma was paralyzed on the right side. They did an MRI, and discovered she had a very large tumor on her brain which is what caused the stroke. The neurologist told us that unfortunately, the first sign of this type of cancer is that they either have a stroke, or a seizure. They could perform surgery, but the neurologist did not believe he would be able to get all of it, which meant it would grow back. There was also a chance it had spread to other parts of her body. As the cancer would grow back and there was no guarantee that she'd regain the use of her right side we decided to let her go. ​Emma had been my Pet First Aid demo dog since I started teaching 7 years ago (she was 2 at the time). We have taught 100's of classes and it was her favorite thing to do. As soon as she saw me pull out the supplies to load into my car, she'd go running to the front door. Those of you who took the course with us saw what a ham she was in class and she was happy to let anyone practice on her. She was also wonderful about being dressed up in silly costumes to advertise the classes. Please visit our Facebook page if you'd like to see them. She was an incredible member of our family and loved life to the fullest. ​For the time being, Molly her half-sister, will be my demo dog in classes. Molly is 11 years old, but still has a lot of energy and loves people. She has some very big paws to fill, but I know she'll do Emma proud. I never thought I would lose Emma so soon. If there is a message here it would be to cherish every moment with your pet, because you never know when it will be the last. Emma woke up perfectly normal that morning, and by 7:30 that night, we helped her cross the rainbow bridge. Run fast, run free my baby girl. I know your spirit will always be with me. I love you to bits and you are and will forever be in our hearts. On November 25, 2016, we said goodbye to Charger who was a Course Content Contributor for many of my examples in the Walks ‘N’ Wags Pet First Aid Course that I teach. 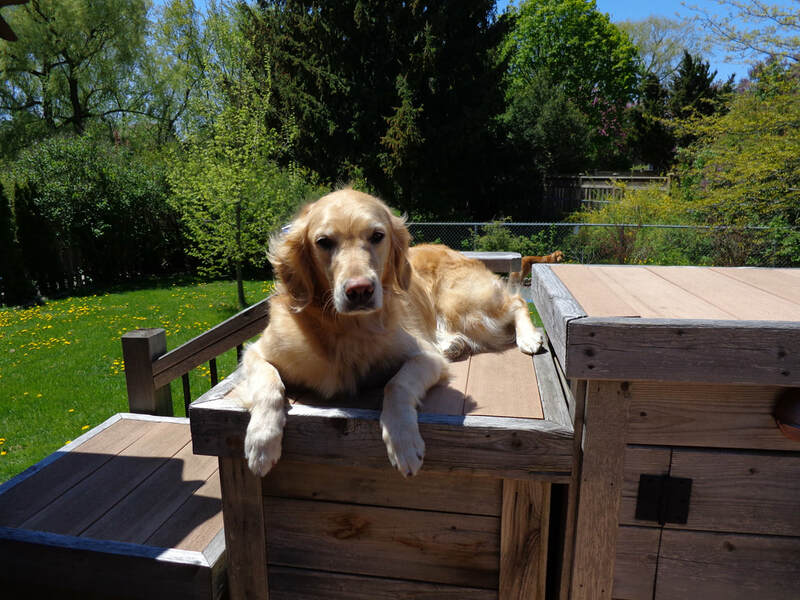 We adopted Charger on March 16, 2015 at the age of 9 from Golden Rescue, where he was being fostered in Manitoulin Island. We knew he would be hard to adopt out because he was a Senior with a number of health issues. He stole our hearts the moment we met him. Molly and Emma, our other two Goldens, welcomed him with wagging tails. Charger was a big Golden with a gentle soul who loved everyone. Those who met Charger instantly fell in love with him. He would want everyone he came across to stop and say hi. He lived every day to its fullest and slowed our walks down to a crawl teaching us to slow down and smell the roses, the trees, the grass and anything else of interest. He would greet us when we got home with his happy barking song. It's one of the things I miss most about Charger. He loved to swim and especially loved his water therapy sessions at Dog Paddle K9 Aquatics in Bowmanville (www.dogpaddlek9aquatics.com) which helped rebuild the muscles in his back end. ​He also sufferred from year round allergies, which resulted in severe skin infections, as well as lung issues and pancreatitis. To all of those at Pickering Animal Hospital (www.pickeringanimalhospital.ca), Toronto Veterinary Emergency Hospital in Scarborough (www.tveh.ca) and Dermatology Department at 404 Veterinary Emergency and Referral Hospital in Newmarket (www.404vet.com), we can’t thank you enough for all the amazing care you provided to Charger over the short time he was with us. Charger crossed the Rainbow Bridge on his 11th birthday from a massive blood clot, and although his loss has left us with heavy hearts, we are comforted by the fact that he made his final journey knowing he was loved. RIP sweet boy. Here is a short video of Charger celebrating life. Here's a humorous look at how paramedics administered first aid to my mom... from the perspective of Emma, my pet first aid demo dog, whose job is to show everyone the correct way to administer pet first aid. Please note: this article is in no way meant to imply that any of the surgeons, doctors, nurses, paramedics or staff were negligent in any way. In fact, we are very grateful for the excellent care they provided to my 89-year-old diabetic mother. My Nana had surgery on her face this morning to remove some skin cancer. She seemed okay when she came home, but later on I knew something was up when daddy quickly sent Molly, Charger and myself into the backyard, especially as it had been raining and I love to play in the mud. Then I heard this loud howling sound coming from a vehicle. I think they call it an ambulance. It stopped just outside the front of our house. I could see our front door by looking through the patio doors that open from my Nana's room. There were three people, two ladies and a man. I couldn't believe it. They made direct eye contact with my Nana and they immediately approached the front of her. You would never do that with a dog. Dogs can act unpredictably when they're hurt. They were asking her all sorts of questions - probably checking to see if she was responsive. Then they put this thing on her finger. That was weird. That's not where the muzzle or mouth tie goes, and it's sure not going to stop her from possibly biting them! The next thing they did was to put this thing on her arm and start pumping it. It looked a lot like the one we use on our CPR dog and cat to check for a pulse, but that's just pretend. So I don't know if they were just practicing. Even if they were, they still didn't check her femoral artery! Maybe they didn't know where it was? After that, they put a thermometer in her mouth. That's not right - it's supposed to go in the other end. After all, Nana could chomp down on that thing and break it. At least they kind of got the bandaging right. They didn't remove the old bandaging, which was good. Instead they added gauze on top of it, and wrapped even more gauze around her head tightly to try to stop the bleeding. But they forgot to use her ear to anchor the gauze, and put a nylon sock over it so the bandage didn't slide off her head. Lastly they put her on a stretcher and covered her with a blanket. I'm so glad they didn't forget to treat for shock, because shock is life-threatening for dogs - and any injury can result in shock. I'm surprised that my mom didn't say anything to the paramedics about the way they administered first aid to my Nana. Maybe it's done differently for humans? In any case, Nana was much better when mom finally brought her home from the emergency clinic. I love my Nana, and I'm sure glad she's going to be okay. When I was about 8 years old, my dad brought home a beautiful white and red fox terrier mix (pictured here). A colleague at work couldn't keep her anymore, so my dad offered to take her. I had always wanted a dog and I was over the moon when he brought her home. We named her Samantha, Sam for short, after the lead character (played by the late Elizabeth Montgomery) on a popular television series called Bewitched. She wasn't well trained, but back then, not a lot of time (or money) was spent on things like that. Nevertheless, I loved her. She was a great companion and followed me everywhere. ​I remember one time, when I was cleaning my room, Sam came to show me a long legged spider that she was holding by one of it's legs. Being scared of spiders, I ran and she proceeded to run after me with the spider dangling out of her mouth. ​Then one day, I went across the street to see my friend who was playing in her front yard. I was 10 at the time. It was a beautiful sunny day. Suddenly I saw the screen door open and there was Sam running towards me. Unfortunately the timing couldn't have been worse. A car was coming down the street at the same time as Sam headed across the road. The car didn't have any chance of stopping in time. It hit her full on and she died almost instantly. I was devastated. ​Now that the warmer weather is here, you might be thinking of leaving your front door open so that the screen door can let some fresh air into your home. If you do, please be sure to lock the screen door. That is how Sam got out. It was one of those fluke accidents. She stood up at the door, her paw hit the handle, and her weight opened the door far enough for her to escape. ​One of the scariest things that can happen while out on a walk with your best furry friend is to suddenly discover they are bleeding profusely. I know this from first-hand experience, because it happened to Amber (past content contributor). During our walks, Amber loved to wander in and out of the creek behind our house. On this particular Sunday she came out of the creek limping, and immediately sat down. I wasn’t too concerned at first, and walked over to her thinking that she must have stepped on a stone. But to my horror, blood gushed out as soon as I lifted her paw. We were quite a distance from home so Vaughan ran to a neighbour’s for help while I stayed with Amber. I didn’t know pet first aid back then, but it was obvious that something needed to be done immediately to stop the bleeding – and I later learned that a dog (or cat) can bleed out from a serious wound in their paw! ​I ripped off my t-shirt (fortunately I was wearing a jacket) and wrapped it around Amber’s paw while waiting for our neighbour, who arrived a few minutes later and rushed us to the Emergency Clinic. Amber needed 7 stitches and almost lost her outside toe. The vet thought that she had probably stepped on a piece of broken glass in the creek, but I later realized that this type of injury could just as easily have happened on the grass or sidewalk. Amber looks very sad in this picture, but she was a very, very lucky girl. Welcome to our recently renovated site! There are stories behind many of the photos on our recently renovated site. That being the case, I thought I'd tell you about one of the more intriguing ones. Here is Molly as featured on our Home page under "Our Contact Form". Molly likes agility. She also likes to look out of my office window. This particular day, she saw something outside that she really wanted to get a closer look at (probably a squirrel). So she jumped onto the window ledge which is not quite the width of an A-frame. Once she was up there, she was very confused as to what she should do next and decided that perhaps my desk might provide a little more room to maneuver. This is when I put my camera down and came to her aid before she injured herself trying to get down. Fortunately, Molly has never tried this again. Agility is a great sport. It gives your dog confidence. Just don't be surprised if they end up somewhere unexpected. In addition to my passion for pet first aid, I am also a dog trainer, a volunteer with Golden Rescue and my dogs and I are part of the Woofjocks performance team.